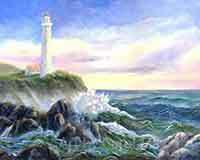 Have you always wanted to learn how to do oil painting? It's easy! Get your supplies together and follow me step by step. 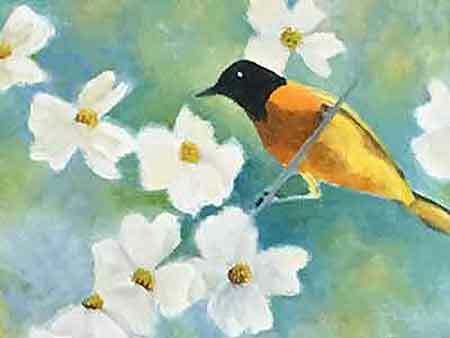 We will be painting a brilliant Baltimore Oriole with Dogwood flowers. what do you need to paint with oils? what oil paint is best for artists? Use professional artist paints. They cover better and will save money in the long-run. Find reputable paint companies here. how long does it take an oil painting to dry? Oil paintings may be handled in a few days. They take months to dry thoroughly. Alkyd paints look and handle like oil paints and they dry completely overnight. Artists may paint out of their memory, their imagination, from life or photographs. 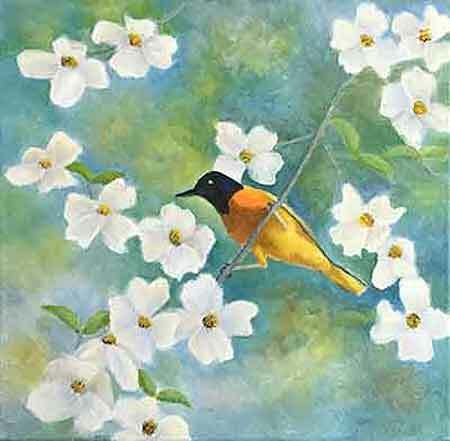 In preparation for this painting I took photographs of the spring blooming Dogwood flowers. 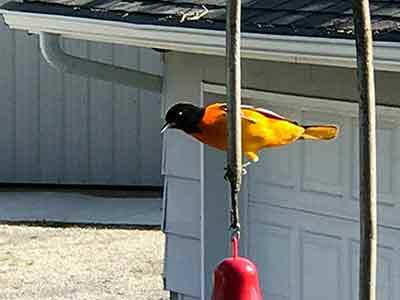 I also used a photo my sister took of a Baltimore Oriole hanging on her bird feeder. It is my common practice to combine two or more photos for a new painting. Many artists do the same thing. This painting uses an analogous discord color scheme. The colors next to each other on the color wheel; a cool and warm yellow, orange and warm and cool blue made the discord. I used a 14"x14" stretched canvas. The canvas is stapled onto the back of the stretcher bars. The sides of the canvas going around the stretcher bars may be painted, so the painting can be displayed without a frame. Winsor & Newton "Galeria" brushes, #4, #8 and #12 flats. All my 'Oil' paintings are done with Griffin Alkyds by Winsor & Newton. I put my colors on a paper palette. 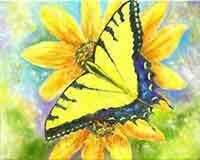 Start an oil painting by putting a line drawing on the canvas with thinned paint or an ordinary pencil. Odorless mineral spirits thins my paint. Gamsol made by Gamblin is considered the best for studio painting. This time I did the drawing on paper first and transferred it to the canvas with graphite paper. 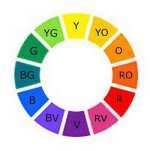 Mix your colors lightly on the palette, more mixing occurs on the canvas while you are painting. Paint the background and the sides of the canvas with the #12 flat brush. Carry the colors from the face of the canvas over the sides of the canvas. This is how to do oil painting on a gallery wrap canvas. Then the finished painting may be displayed without a frame. Use a variation of your warm and cool blues mixed with white. Integrate in some greens you mix from blue and yellow. Occasionally put in some orange or yellow to indicate light and warmth. It is a good idea to repeat colors throughout the painting. 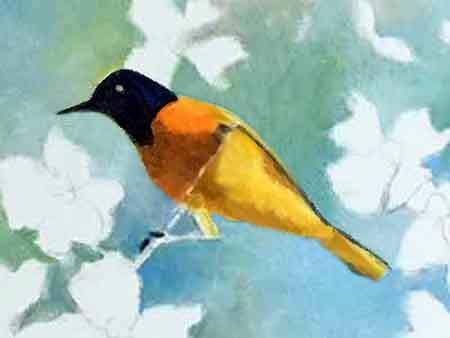 The orange and yellow help warm up the cool background and tie it together with the warm colored bird. The background colors are softly blended together. The various background colors suggest things in the distance without having to paint any detail. Paint all around the bird and flowers. 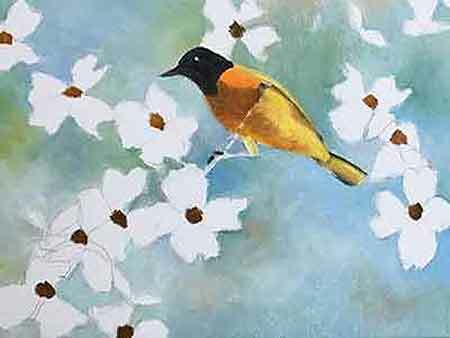 Use a #8 flat brush to paint the bird except for its left leg and eye. We will let the paint set a bit before doing these. The bird is painted with various yellows and oranges. Make the colors brighter and warmer on the sunlight side. 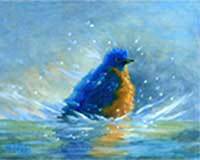 Mix a black from your blue and orange and paint the head and beak. Use the #4 brush to paint the beak and toenails. Always mix your dark colors using the colors in the rest of your painting. Tube black is a dull, uninteresting color. When you mix your own black and it will harmonize with the rest of the painting. Learning how to do oil painting is fun when we don't stress out by trying to be perfect. Just have fun! 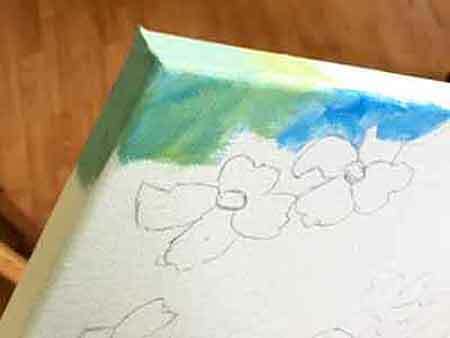 Mix a brown from Ultramarine Blue and orange for the flower centers. Use the #8 brush to dab in the centers. When you are learning how to do oil painting always use the largest brush possible. This keeps your painting loose. Paint the petals with a soft grey. Mix the grey by adding white to the brown you used for the flower centers. Add more blue if necessary to keep the grey on the cool side. Add yellow or orange to white to make a warm white for the parts of the petals that would be catching the light. Mix some green and paint a few leaves with light and dark areas. 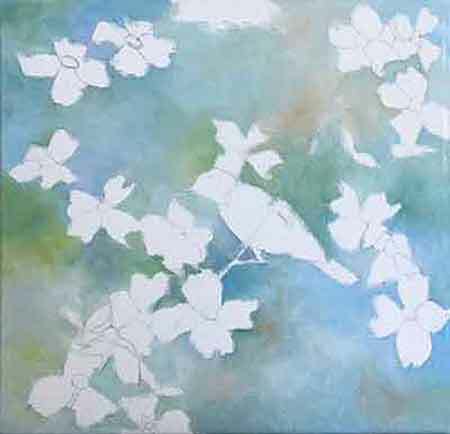 Spot out where you will paint the branches and leaf stems. Use the old trick of how to do oil painting; look at your painting upside down. It will give you a fresh look to see any mistakes. The background was a bit light, so I darkened it for more value contrast. Start the leaves and stems. 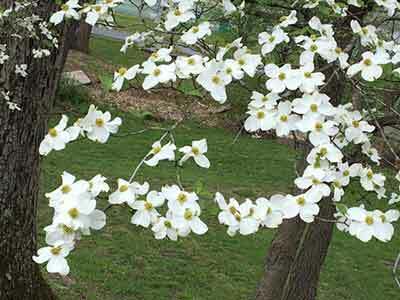 Paint the Dogwood branches and stems. Mix light and dark greys. Give the branches a light and a dark side to make them look rounded. Paint his legs with a light grey. Mix blue and orange with white to lighten it. Make sure to do his black toenails hanging over the branch. The yellow belly behind his left leg (on the right in the painting) is brighter yellow on the sunlit side and shadowed on the other side. Touch a bit of color in the eye. Use a very pale yellow white on the top of the eye. Put a bit of pale blue-white on the bottom of the eye. Have both cool and warm white on the flower petals to help separate them from each other and show where light is hitting them. it's your turn to paint! 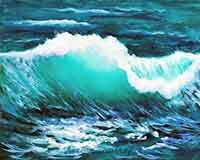 Now that you know how to do oil painting, get your oil painting supplies and start painting. 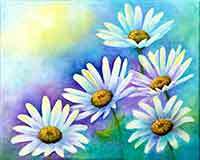 When you are learning how to do oil painting, relax and enjoy yourself. You don't have to paint like a photograph. 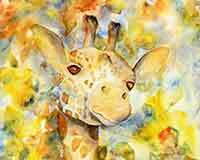 Paint from your heart and express yourself - that is a lot more fun! 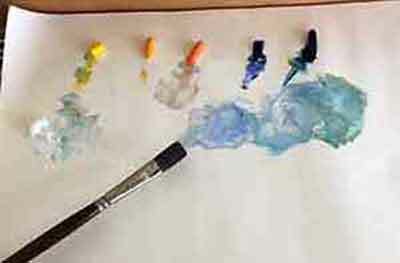 Try some of the other how-to paint pages. The more you paint the more fun it is and the faster you will progress. I wish you many successful paintings!